Chalet Cristalliers is a luxury traditional chalet in Chamonix town centre. Set in its own grounds with ample private parking, its sunny, southerly facing aspect gives magnificent views of the Mont Blanc massif. Five en suite bedrooms provide super king or twin beds for up to 10 people. Features include open plan lounge/dining room/kitchen with satellite HD TV, Surround Sound Hi Fi, BlueRay, Wi-Fi, open log fire, heated boot room, parking for 3 cars, private garden with luxury hot tub/jacuzzi and south facing terrace. Located in the traditional La Frasse area of Chamonix town, it is within walking distance of the nursery slopes, which include green, blue and red runs. Other ski lifts within Chamonix town access the ski areas of Brevant and Flegere. Less than a 2 minute walk away from the chalet is a ski bus stop which provides access to all ski areas in the Chamonix Valley. It is a 5 minute walk to the Market Square, bars and restaurants, swimming pool, ice skating rink and cross country skiing. All bath and shower rooms have luxury Italian tiling, glass panel showers, underfloor heating and heated towel rails. There is underfloor heating throughout with individual temperature controls in every room. Sheets are luxury Egyptian percale cotton and goose down duvets. The washing machine has an integrated tumble dryer. There is a full log fireplace with a sliding fire safety glass front. There are two full size ovens with self cleaning. There is a combination microwave/grill. There is a Nespresso machine. Dishwasher tablets, refuge sacks, kitchen towel, cleaning sponge are all provided. There is a fully heated ski and boot room for warming and drying boots and gloves etc. Chamonix has a fantastic golf courses that welcomes non members. Self-catered prices include heating, luxury percale bed linen, luxury goose down duvets, wood for log fire, end of stay clean. We include bath towels, hand towels, tea towels and bath mats. Quality chalet in great position. A group of 8 we enjoyed a great New Year week in Chalet Crystallisers, the accommodation is first class and in a great position to allow easy access into the centre of Chamonix and the different ski areas. The chalet is extremely well appointed and the hosts were readily available to address any questions we had during and before our stay. Faultless and highly recommended. Wonderful property. We stayed the last week of August - first week of September 2018 for 2 weeks. We can't wait to go back! Jayne, the owner, is absolutely wonderful and saw to every detail. We were 5 adults and we stayed for 2 weeks. The home is perfect for a large party. It features a large living room with comfortable furniture, huge dining area and a very workable kitchen. There is a beautiful deck just off the main living space and even includes a very nice hot tub. The 5 bedrooms, each with a full bath and a TV in every room made it very comfortable for all. Don't miss the trails directly across the street from the property. Miles and miles of biking and hiking trails that we didn't realize were there until the day before we left. You can rent bikes just up the street. The Micro-Brasserrie de Chamonix is a very popular pub just a 5 minute walk down the street with great food. We love the Saturday market! Don't miss the Elevation 1904 Restaurant and Bar. Our favorite Restaurant in the valley is at the top of the Plan Praz gondola. La Bergerie de Plan Praz. Paragliding is an awesome way to see the valley. This was our third trip to Chamonix and we look forward to the next. So much to see and do. Still haven't covered it all. Thanks Jayne!!! We spent a week in this fantastic chalet in July 2018. 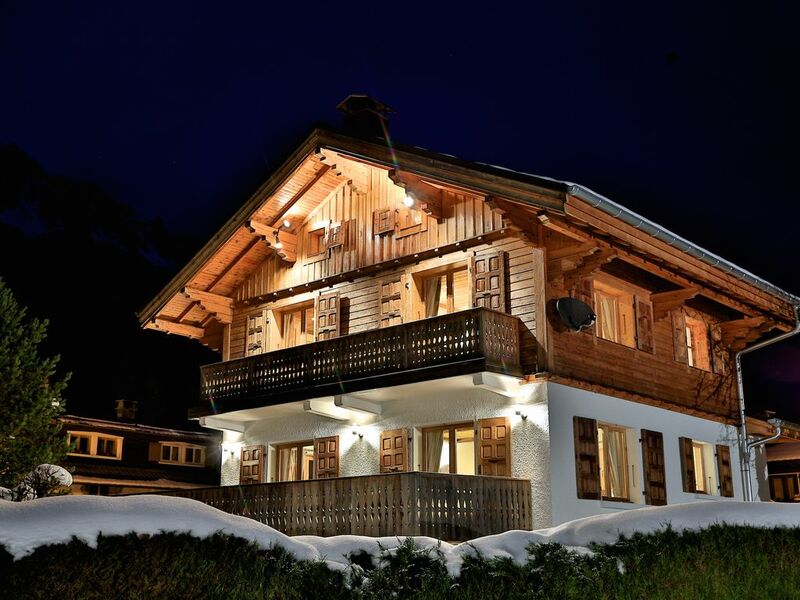 The chalet is beautiful, inside and out and is maintained to a very high standard. There was plenty to do in the summer for adults and teenagers alike. I can recommend getting the cable car up the mountains on both sides of the valley, the views are spectacular. We also did the white water rafting which was fantastic fun and the brave ones did the paragliding which they really enjoyed. I would definitely recommend this place to friends and relatives and can't wait to go back. We spent 10 days in Chamonix and the surrounding Region and used the Chalet as our base. It very comfortably accommodated our family of 5 and had everything we needed to make our stay perfect. Jayne was always accommodating and very responsive to any question we had. The Chalet was just as pictured and was within walking distance of all that the town has to offer. As a large family we generally look to book a house or chalet and this was by far the favorite of the family so far. This chalet is very cute and very well kept. It had so many great features: comfortable beds, a relaxing hot tub and fireplace. The owners were lovely and so helpful. There was plenty of room for two families. Walking distance to bakeries, restaurants and shopping. Would stay again in a heartbeat, highly recommend. We stayed at Chalet Cristalliers just before Christmas (December 2017). Originally we were going to be a party of 10, but then an additional 2 friends decided to join us at short notice. Firstly the Owners Jayne and Jonathan couldn't have been any more helpful and accomodating, not only with this last minute change, but their responsive communication and helpful advice also made the whole process and our stay a wonderful experience. The Chalet is brilliantly appointed and spacious and at no time did we feel crowded despite there being 12 of us. The kitchen is brilliantly designed and made cooking for such a large group a breeze. The location is fantastic - the nearest bus stop is only 50m away and it is also only a short 5-10 minute walk to the nearest bakery. You will not be disappointed by Chalet Cristalliers. It is undoubtedly the best and reasonably priced ski accomodation we have ever experienced. I can also recommend the local micro brewery, just a short 3 minute walk away - great beer and food and not expensive. We have already booked again for 2019. The Chamonix valley stretches for about 10 miles around the foot of Mont Blanc. The valley is home to the town of Chamonix itself in the centre as well as a number of communes including Les Houches & Argentière at either end. Chamonix is a world famous mecca for winter sports. Off piste opportunities abound. There are two areas solely for beginners whilst the chalet is centrally located between the four main ski areas of Flegère, Brevent, Grands Montets and Le Tour giving something for everyone. If conditions permit try tackling the unforgettable off piste run down the Mer de Glace from the 3842m peak of the Aiguille du Midi. From May to September there are a multitude of activities for the active visitor. Try paragliding, white water rafting, canyoning, mountain biking, climbing or simply hike or stroll along the pathways and take in the spectacular scenery. Ski: Chamonix is a world famous Mecca for winter sports. Off piste opportunities abound whilst there are pistes giving a vertical drop of over 2000m ... try doing that without stopping. There are two areas solely for beginners whilst the chalet is centrally located between the four main ski areas of Flegère, Brevent, Grands Montets and Le Tour giving something for everyone. If conditions permit try tackling the unforgettable off piste run down the Mer de Glace from the 3842m peak of the Aiguille du Midi. The chalet is available on a weekly basis from Saturday to Saturday. Bookings for multiple weeks will benefit from a 10% discount. Rates shown include all utility bills and local taxes. A 25% deposit is required to secure the booking.